This recipe comes courtesy of Dan Brophy, a cooking instructor at In Good Taste in Portland, Oregon. 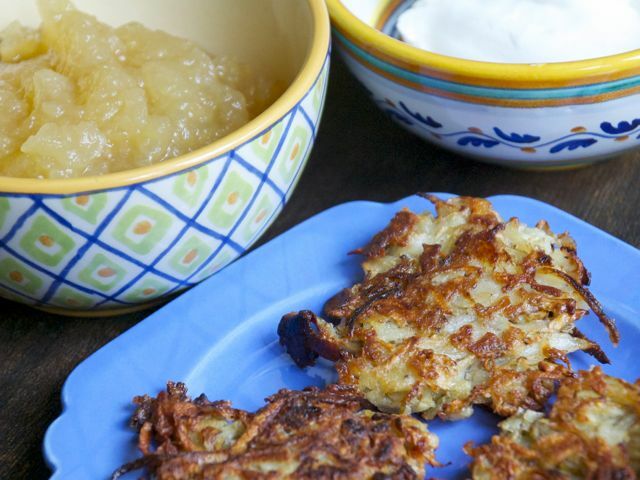 Try serving this twist on traditional latkes with sour cream and applesauce, or as a stand-alone item at a winter-holiday brunch. Grate the roots into coarse shreds and sprinkle them with one teaspoon of salt. Toss them in a bowl and set aside for 15 minutes. Squeeze moisture out of grated chokes and transfer to a clean bowl. Mix in the onion, eggs, and crumbs. Heat the oil in a deep saucepan and fry a test cake; adjust seasoning level if needed. Fry over medium heat until crisp and golden-brown, about two minutes per side. Blot on paper towels. Serve immediately or hold in a slow oven at 250 degrees until ready to serve. Learn more about sunchokes in the Produce Diaries.